Active & Safe Routes to School promotes the use of active and sustainable transportation for the daily trip to school, addressing health and traffic safety issues while taking action on air pollution and climate change. All students have the opportunity to walk, bike or bus to and from school as a part of their daily school experience. To realize a measurable shift walking, biking and busing for the trip to and from school, for the health and well being of our students, communities and environment. Increase community capacity to advance the use of walking, biking and busing. Advocate for policy and infrastructure that facilitates walking, biking and busing. 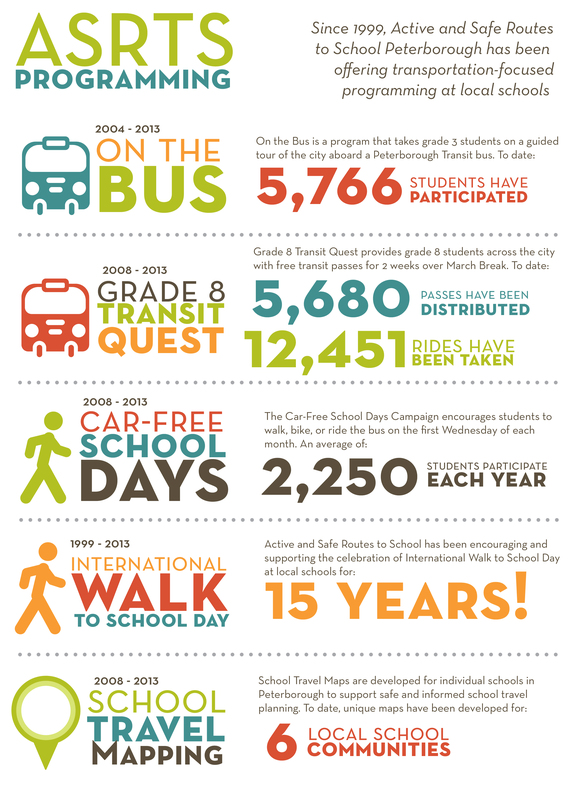 Improve community safety as it relates to walking, biking and busing to and from school. GreenUP, City of Peterborough, Peterborough Public Health, Student Transportation Services of Central Ontario, Crossing Guards of Peterborough, Kawartha Pine Ridge District School Board, and the Peterborough Community Police.